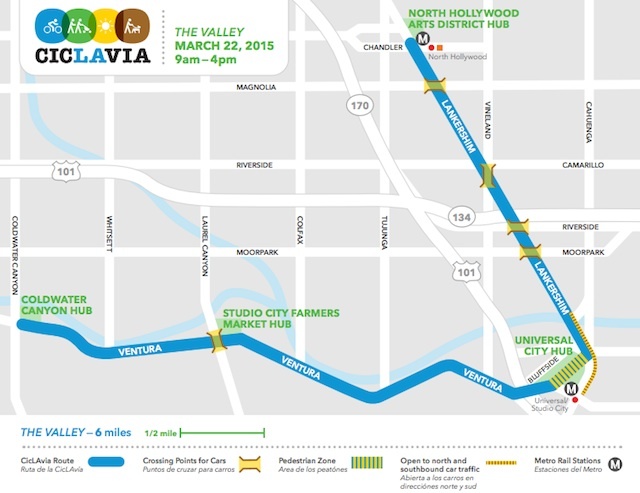 CicLAvia heads over the hills and into the San Fernando Valley for the first time tomorrow (Sunday, 3/22) running 5.5 miles along Lankershim Boulevard between the North Hollywood Metro Red Line stop at Chandler Boulevard and the Universal Studio Red Line stop, and along Ventura Boulevard between Campo de Cahuenga and Coldwater Canyon. 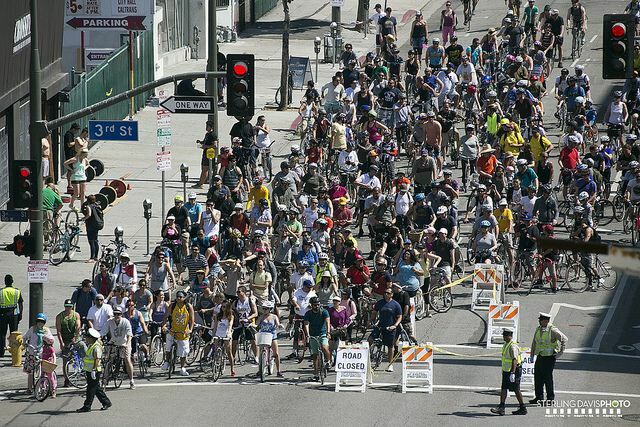 Streets will be closed between 9 am and 4 pm for Angelenos to bike, walk or skate (anything, really, without a motor) the route. Listen to the soundscape: CicLAvia and the Los Angeles Department of Cultural Affairs have commissioned two Dutch artists, Rob van Rijswijk and Jeroen Strijbos, to “create an interactive soundscape composition that brings together the past and present of the San Fernando Valley.…” Download the free Walk With Me iPhone app, which is an interactive walking art installation that’s activated by GPS markers on the route. As you cross markers, listen to music, interviews, old radio and movie clips that are mixed with sounds that are filtered and processed through the phone&apos;s microphone. The installation is meant for walkers since remember it’s illegal for bicyclists to ride with headphones in both ears. Learn to curl while eating peanut butter: Hollywood Curling takes over the parking lot of Spread PB—a Peanut Butter Bar (12215 Ventura Blvd., Suite 104) to bring street curling to the public. We’re curious to see how you curl without, umm, ice, so we’re putting this one on our CicLAvia agenda (plus we love peanut butter). Hollywood Curling members will be on hand to instruct and answer questions about their team, but more importantly, we need to test out the Banana Sushi and the Give Me S’more at Spread PB. Lounge at the Sportsmen’s Lodge: We haven’t been to the Sportsmen’s Lodge (12833 Ventura Blvd.) since it remodeled and reopened last year. With a history of being an early Hollywood hangout for the likes of Clark Gable, Humphrey Bogart and Lauren Bacall, the Lodge’s facelift includes a newly remodeled Patio Cafe and pool area that surrounds the largest pool in the Valley. Learn a little history: Campo de Cahuenga (3919 Lankershim Blvd.) has an important role American—and California—history. It was the site where Gen. Andres Pico and Lt. Col. John C. Fremont signed a treaty in 1847 that led to the end of the Mexican-American War and created the state of California. Campo de Cahuenga’s museum and gardens will be open for self-guided tours will offer programs throughout the day. Quench your thirst at Idle Hour: Riding or walking around in the hot sun all day gives you the perfect excuse to check out Idle Hour (4824 Vineland Ave.), the barrel-shaped bar from The 1933 Group (the guys behind Sassafras, Thirsty Crow and Bigfoot Lodge). They have spruced up old classics like Moscow Mules or Old Fashioneds—which are both on tap. For more things to do at CicLAvia (besides bike riding), check out the Neighborhood Guide and the Activities Along the Route. Try and take public transportation because parking is limited. There’s no parking at the Universal City Metro lot from today at 6 pm through 8 pm on Sunday, but there is parking available at the North Hollywood Metro lot.